We LOVE this hidden, but highly utilitarian, access to kitchen utensils. To the naked eye this base cabinet looks like a typical three-drawer configuration. But when you pull the top drawer open you find this great way to organize utensils without storing them on the countertop (and creating visual clutter). does anyone answer these questions? - Just waiting on an answer? If you show this to any cabinetmaker/kitchen company they would be able to make it. If they are unable too i think they don't deserve your business. It is custom but its certainly not difficult. Diamond Cabinetry also makes an insert like this for their Lowe's line in Diamond Reflections. It's one of their pull-out cabinets. Hi Chrisa23 You can find a product very similar to this that can be fitted in most existing cabinets from Rev-a-Shelf. Here is a link to their website. I have used this for a few clients. http://www.rev-a-shelf.com/p-513-base-cabinet-pullout-knife-utensil-base-organizer-blumotion-soft-close-sink-and-base-accessories.aspx I hope this helps you. 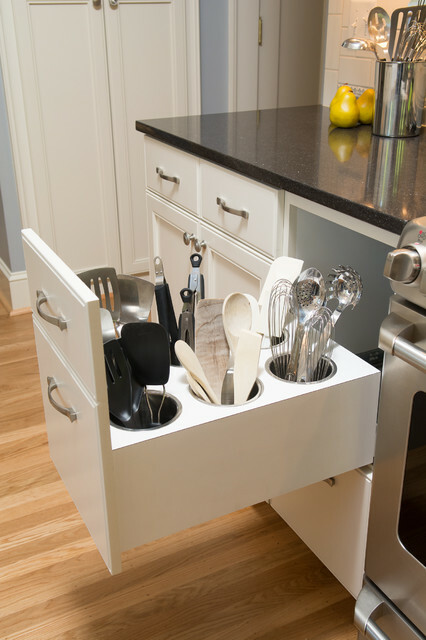 Custom made utensil draw - Where can I have this made? Love it! What size is the drawer? - Renovating a kitchen & I would like to incorporate this idea into it...could you please tell me the size/height etc of the drawer & cylinders please? 7. UtensilsDrawers don’t always have to utilise a horizontal storage solution. In this example, deep ‘pockets’ have been installed to allow for the upright storage of cooking utensils. This arrangement makes the utensils easy to see and easy to pick up during busy cooking times. Using a number of smaller pockets also allows for similar items to be grouped together, which makes finding the one item you are looking for so much easier. storage. store utensils upright in drawers by stove. Put drawers for food storage in island. Pull out drawer for crock pot, blender and griddle. Love the utensil drawer next to the stove.